Additive manufacturing is an amazing set of technologies that can add huge value to engineering components such as light-weight topology optimised brackets or complex manifolds that would, otherwise, be impossible to manufacture. However, on the more fun side of things, it can also be used to add a bit of bling to your wardrobe. 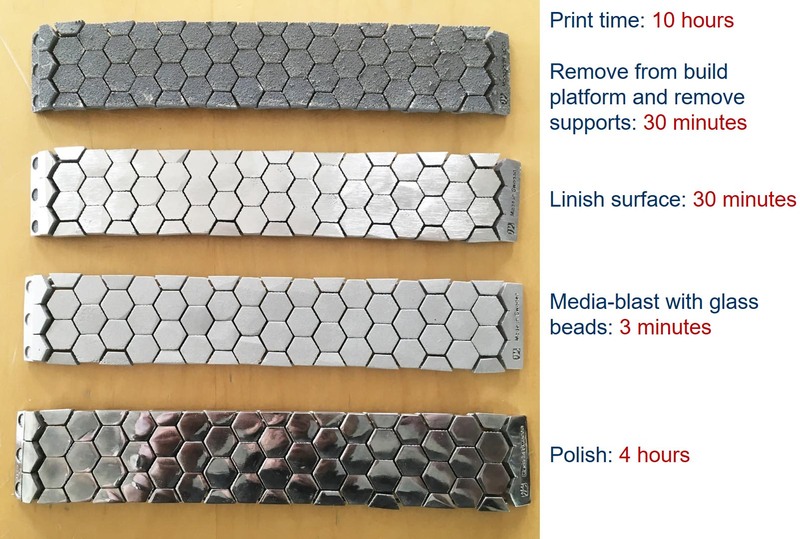 I started this fun little project purely as a design exercise to see if I could figure out some clever linkage mechanisms that allowed me to print metal parts with moving patterns of tiles. Once I had figured some mechanisms out, the next logical step was to transform them into a metal AM demonstration piece, so I decided to expand the link mechanism into some bracelets. 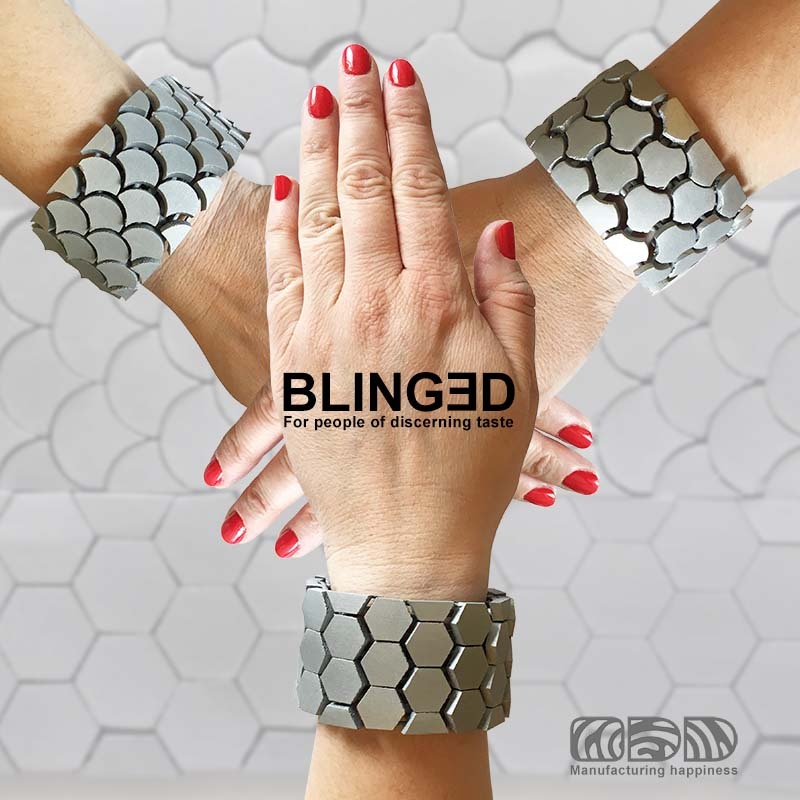 The bracelets needed to be printable as a single component, but with suitable gaps between the moving parts so that they could be printed on a metal AM system, and then removed from the build plate and transformed into wearable jewelry with a minimum of post-processing. 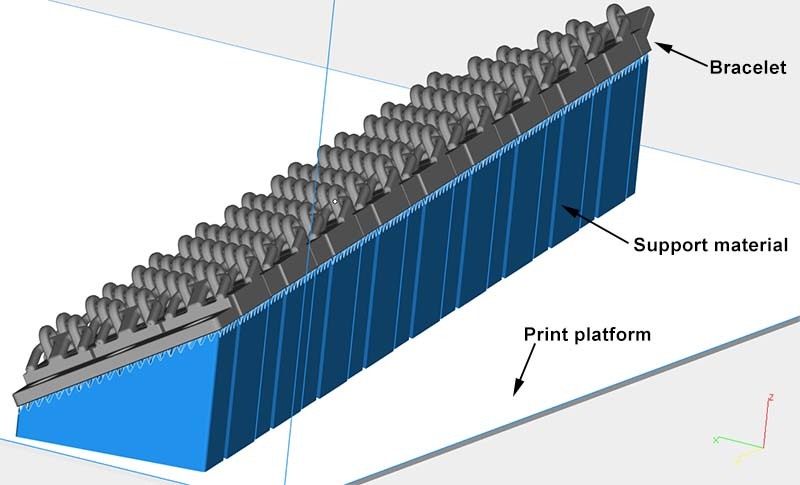 With metal additive manufacturing in a powder bed fusion system, parts are welded to the build plate with support material that has to be removed after the part has been printed. The support material is there for several reasons: First, to stop the parts from distorting as the welding process is occurring; second, to stop the mechanical force imparted by the powder spreading mechanism from knocking the part, or delicate features, over and, finally, to stop the melt-pool of the powder that is being melted for any overhanging features from sinking into the powder beneath the unsupported area. Another general rule of metal AM is that bottom flat surfaces do not like to be printed horizontally. 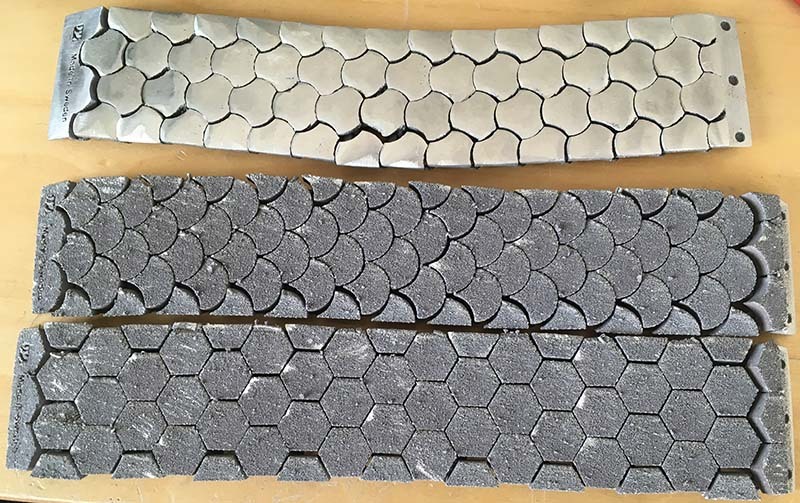 The reason for this is that, when a large surface area of metal is being melted by the laser, the surface is continuously trying to curl up, and this induces all kinds of stresses into the part which often results in cracking on those large flat areas. Because of this, it is very common to see parts being printed at strange angles to try and avoid large flat horizontal areas. A down-side of having to do this is that it can greatly extend print-times. Because of this, when the bracelets were printed, they were rotated at 30 degrees in the x-axis (to avoid large horizontal down-facing surfaces), and 10 degrees in the z-axis (to avoid the powder-spreading mechanism from encountering an area parallel to the spreading mechanism). After printing began the joyous task of post-processing. For those who are not familiar with metal AM, it is vitally important to understand that it is not easy. It requires both a large amount of time to set up a print job with the appropriate orientation and support material for the parts, to print the parts, and then a large amount of time to post-process the parts. The results of a 2018 survey by the Wohlers Report shows that, for metal AM, almost 45% of the cost of a part is in pre and post-processing. This post-processing includes heat-treatment, the removal of support material, and then treating the visible surfaces to have an acceptable surface finish. The image below shows the bottom facing surface of 2 of the designs after they have been removed from the build plate, and had their support material removed. As can be seen, the surface finish is less than acceptable, and must therefore be either machined, linished or filed clean. The 3rd design is about half way through post-processing. And here they are showing the different stages of finishing and the times involved for each stage. The bracelets were printed in AlSi10Mg aluminium alloy to keep the weight down, and use magnets for the clasp mechanism.